One thing that always makes me happy after reading an e-book, rare that I do read one though, is that I don’t feel that I’ve read an e-book. That is to say, it has managed to engage me to the extent that I haven’t felt the strain of reading it. I’m not a big fan of Kindle reading personally, but of late, I’ve read a couple of decent novels on my PC, so happy to note that this book is one of them. Zeenat Mahal’s book Haveli takes us Pakistan in the seventies, a setting that I have not read previously, and the moti of that mahal is a 20 year old girl named Chandini, who oddly enough, hates her name and calls herself C. The story brews around her, her love for an older man Kunwar and her grandmother, who she unceremoniously and unabashedly refers to as The Broad. The love story is thrown helter-skelter by the arrival of Taimur (promptly nicknamed as Alpha Male) and “the Broad”’s decision to get C married to him. The story is a straightforward one, and has no big twists and turns, though a small unexpected twist does come sometime. I won’t go into even the small details, since it is sure to give away the plot. So, straight to the heart of it. What’s good in the book is that it is pacey. You can finish it in a couple of hours and not feel bored at all. The characters are interesting and keep you engaged in their story. The main character C is portrayed nicely as well. Simple narration, nothing to make you head for a dictionary. All in all, it works well. What I felt odd was to see the nicknames taking over through the novel. Taimur isn’t called by his name, rather the nickname. Though I do agree that in context of C’s character it is warranted, it being spread throughout the story kind of felt strange. Nothing to the extent of making the book terrible, but still something I personally did not like. One time read, but a worthwhile one-time read. Engaging and very enjoyable. This is Zeenat’s first publication. Congratulations for that to the author! Zeenat Mahal is an avid reader and has been writing for as long as she can remember. She has an MPhil in English literature from Government College Lahore and is currently doing an MFA in creative writing from Kingston University, London. 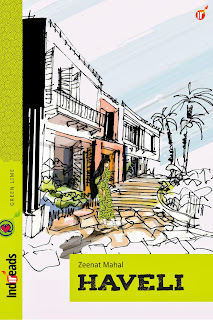 "Haveli" is Zeenat’s first published novella. Currently she is working on a literary novel with elements of magical realism, while continuing to write romances. Reviewed by Leo, for Indireads.